The City of Delaware is moving forward with plans to upgrade The Point, the intersection of U.S. 36/State Route 37 on the city’s east side. The project calls for replacement of the Norfolk Southern railroad bridge and expansion to two lanes in each direction. The estimated cost of the project is $25,183,333. Construction is expected to begin in 2021 or 2022. On Monday, City Council unanimously adopted a resolution that allows Homan to enter into a Local Public Agency (LPA) Federal ODOT-Let Project Agreement with the Ohio Department of Transportation for The Point project and to execute contracts as required to design, acquire property for, and to construct the project. Although Homan pointed out the project — which will replace the Norfolk Southern railroad bridge over U.S. Route 36/State Route 37 to allow for the road to be widened to two lanes in each direction — is a long-term one with construction not expected to happen until 2021 or 2022, city officials like Public Works Director/City Engineer Bill Ferrigno are eager to get started. 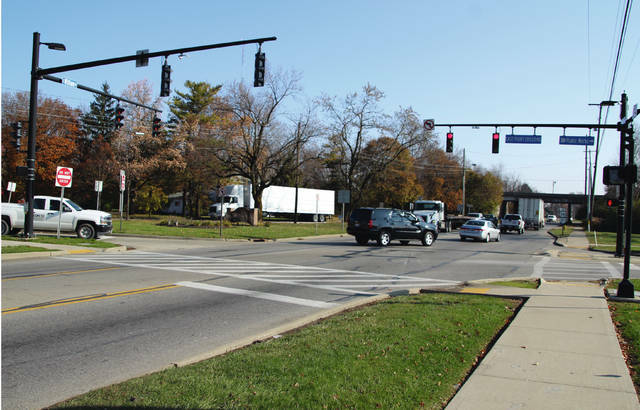 Along with replacing the bridge to improve traffic safety and flow on one of the city’s main routes, the project will also create additional through and turn lanes at the intersection of 36/37 and State Route 521. Included in the LPA agreement is a breakdown of funding sources for The Point Railroad Bridge Replacement Project, which has an estimated price tag of $25,183,333. As of Nov. 13, the city has secured nearly $18 million in state and federal funds that includes $3 million in federal safety funds and a $1.5 million grant from the Transportation Review Advisory Council. The largest funding source is a $13-plus million construction grant from the Mid-Ohio Regional Planning Commission. The remaining balance of $7-plus million is currently projected to be funded through $1,195,820 in revenues from the Berkshire Joint Economic Development District Income Tax as well as the Tanger Outlet Center New Community Authority, while the city is left with a local share of $6,208,046. Ferrigno said it’s the city’s goal to try to cut the $6 million funding gap in half by acquiring additional state or federal dollars to put toward the project. While the city continues to work to show the state it’s committed to moving the project forward as quickly as possible, the city is hoping the county will step up to lend its financial support. “We have made a request to Delaware County as well that they consider participating in this type of project because of its regional significance,” Homan said. Council will hold a public hearing and first reading of an ordinance establishing appropriations for 2018 at 7:30 p.m. on Nov. 27 in city council chambers. The ordinance will undergo a second public hearing and second reading at 7:30 p.m. on Dec. 11. Mayor Carolyn Kay Riggle read a proclamation declaring Nov. 25 as Small Business Saturday. “We really encourage all of our community to go out and support our small businesses,” Riggle said. Council heard the first reading of ordinance in which the Judith D. Hook Revocable Trust is seeking approval of a rezoning amendment for approximately 44.258 acres of land located across from Smith Park on the west side of Troy Road. If approved, the zoning would change from R-4 Medium Density Residential District and R-6 Multi-Family Residential District to R-3 One-Family Residential District. A public hearing and second reading of the ordinance will be held at 7:20 p.m. on Nov. 27 in city council chambers.